The very capable Jim Scuitto was in the AC360 anchor chair in the 8pm and 9pm ET hours. They have set a record together. They inspire the masses, whether we are looking at their personal lives or their professional endeavors. Andy Cohen, the host of Watch What Happens Live, and Anderson Cooper, a CNN journalist, are both beloved celebrities, and together, they are even more magical; even more loved and even more popular. Since 2015, they have been touring together on AC²: An Intimate Evening With Anderson Cooper and Andy Cohen, full of deep talk and shallow tales. They have set a record together. They inspire the masses, whether we are looking at their personal lives or their professional endeavors. They vacation together, and other super famous celebs are usually along for the ride. They are down-to-earth, despite the fact that they are so inspiring, they hang out with stars, and they have seen so much success in life. I could go on and on... And I did, down below. So continue reading to learn the details behind 15 facts that make us love Anderson Cooper and Andy Cohen even more! With Andy Cohen and Anderson Cooper, what we see is what we get. As the son of artist, author, actress, fashion designer, heiress, and socialite Gloria Vanderbilt, Cooper has always sort of been in the spotlight. His career has made him a well-known television personality, as he was a correspondent for ABC News, became an anchor on American Morning, and eventually got his own show on CNN. But despite growing up in the Vanderbilt family, reporting on major worldly issues and hanging out with celebrities like Madonna, he is actually an introvert. On the other hand, Cohen is as wild and crazy in real life as he is on his Bravo show. He is obsessed with pop-culture, he is always looking to have a good time, and he apparently has bizarre celebrity encounters all the time. Together, they balance each other out, like real-life friends do and should. When they are traveling together and doing their show together, they have real conversations about everything; from family and fights to politics and paparazzi — just like us “normal” people do! They just do so regularly in front of huge live audiences and sometimes while accompanied by big-time singers, actors, or real housewives. Both Anderson Cooper and Andy Cohen have travelled the world—for work and play—and now, for their intimate live evenings around the country. Last fall, when the two went to Houston for their event, they did an interview with the Houston Chronicle, and in it, both stated how much they truly love the city. Cohen was even the Celebrity Grand Marshal for the gay pride parade there in 2010. He also “took a lover in Houston” — a phrase that Cooper feared he would try to have printed on T-shirts for their show! Cohen went on to say that the intimate encounter he had in Houston was not insignificant and that he and this mystery person are still very much in touch. Whether lovers are involved are not, the two enjoy trekking across the United States, meeting new people, going out into new cities—before and after—the shows and doing it all with each other. Cohen sometimes even goes a week early, just to really immerse himself into their new temporary homes. Cooper also mentioned that, of course, there would be no point in doing AC² at all if it were not fun for them and fun for the crowds they draw. In 2015, it was announced that Andy Cohen and Anderson Cooper would be teaming up and going on the road for this live and intimate show. The two had already been friends for years, and since they are proof that opposites attract, AC² was sure to be a hit from the beginning. Cohen even shared their early planning process with social media, saying that they were cracking themselves up; a foreshadowing of all the laughs that their audiences would experience while watching them in person. Now, when I say that Cooper and Cohen are a match made in heaven, let me be clear: They are only friends and nothing more. In fact, they were set up on a date years ago. They had a phone call before the date and right there—during that call—both of them could tell that they were not romantically meant to be. But that was fine! They still met, they became very good friends, and now, we get to see this friendship bloom and grow right before our very eyes; the two are always sharing photos of themselves together online, and their events are even further proof of how much they cherish one another. How cute! Anderson Cooper reports on more serious issues; such as natural disasters and political campaigns. While Andy Cohen deals with more trivial matters, like which of the waitstaff at Pump restaurant are dating and which housewives will be returning to which cities. However, they definitely keep up with each other’s worlds, and their live tour includes around a full half-hour of just questions and answers. People ask about everything from famous people they have met, to requests for them to give birthday shout outs, but most of the questions are for Cohen and are about The Real Housewives. And if Cooper were a housewife, here are some possibilities for his infamous tagline: I’ve been rich, and I’ve been famous, and now, I’m both, bit—s! I might be the silver fox, but that doesn’t make me any less of a cougar. I don’t keep up with the Vanderbilts; I am the Vanderbilts. Climate change may be real but there’s no way to turn down the AC! Similarly, if Cohen were to run for president, he would focus on peace, no discrimination, weed legalization, no racism, fair—but sensible—disbursement of firearms, and no war. Those were at least his answers when he was asked what he wished for the world. but he did say that Teresa Giudice would be his running mate. Andy Cohen is a radio host, an author, and the Executive Producer of the Real Housewives franchise, but he is probably best known for his talk show on Bravo, Watch What Happens Live. The show features guests such as Bravolebrities, actresses/actors,and musicians, as well as other stars (like Anderson Cooper!). Once when Cooper was on Cohen’s show, the two played "One, Two, AC!" to put their friendship to the test. How did it go? Well, Cooper thought that Cohen wears boxers, but he wears briefs. Cohen knew that Cooper was a fan of Narcos. And since Cooper is a catastrophist, Cohen’s answer of his pal’s biggest fear (going broke) was a likely answer. Also, Cohen answered in a matter-of-fact way that Cooper would actually be the bigger freak in bed! Since both Cohen and Cooper are in the spotlight, several of their secrets have been made known before — even at their AC² intimate evening. But nearly every guest on Watch What Happens Live has to spill some major secrets (since games like “Plead the Fifth” are played). Therefore, seeing these two friends being forced to answer some personal questions about each other was like a dream come true for fans. Some people may think that Anderson Cooper and Andy Cohen are just friends because they have to be; since they travel all over doing their show, that must be why they hang out, right? Well, it turns out that they hang out outside of work, too, and last summer they took a vacation together to Tahiti! Cohen shared this picture of the duo, with a caption saying that he "caught a silver fox swimming by a deserted island." Cooper shared the photo, too, but does anyone notice anything interesting about it? Yes, it shows celebrities enjoying an island getaway. Yes, it features two friends who are talented, attractive, and too good to be true. However, Cooper and Cohen are wearing matching black rash guards! They are totally twinning. Is it a coincidence? Did they buy them there together because they both forgot to pack their own? Or are they just that cute and perfect? Whatever the reason, I love it. I love giving everyone else more reasons to love these two! Last year, Andy Cohen and Anderson Cooper had a joint appearance on the The Tonight Show, and of course, while on the show, host Jimmy Fallon asked about the time the two almost dated. As I mentioned, Cohen and Cooper were set up on a blind date, and they had a phone conversation before the date. That one call was all either of them needed to know that a serious relationship would not work. But why? What happened? How was it so awful of a call? Well, Cohen—being the pop-culture-obsessed person he is—asked Cooper about his mother, the famous Gloria Vanderbilt. In Cooper’s eyes, asking such personal questions should come later in a relationship, and Cohen could tell he shut down when asked about her. He just got too excited about dating that Vanderbilt boy! But, now he knows, and now, the duo has talked about anything and everything. Plus, they get paid to do so, as they tour the country together! And numerous fans have paid to see them live, have watched them on their own shows, and now have watched them talk some more with Jimmy Fallon on late-night television show (because no one can get enough of them!). Andy Cohen spent 10 years at CBS News, then was the head of development at Bravo for more than 10 years. His autobiographical memoir, Most Talkative, became a New York Times Best Seller. He has hosted numerous events (such as Miss USA 2011 and Miss Universe 2012). He played Zeus in Lady Gaga's music video for "G.U.Y." He has a radio show on SiriusXM. He is the host for the revival of Love Connection. He has appeared as himself on shows such as Unbreakable Kimmy Schmidt and even Riverdale. Anderson Cooper worked at the small news agency Channel One, became a correspondent for ABC News and became CNN's weekend prime-time anchor. He now has his own show and has covered events such as the tsunami damage in Sri Lanka, the death of Pope John Paul II, and the royal wedding of Prince Charles and Camilla Parker Bowles. He also narrated the 2011 Broadway revival of “How to Succeed in Business Without Really Trying” and published a memoir, Dispatches from the Edge, which became a New York Times Best Seller. Plus, they take time to travel together, for fun and for work, as I mentioned, and both just lead super inspiring lives! From the years 2012 to 2016, Out Magazine listed Andy Cohen as one of the Most Powerful Gay People, and he is the first openly gay host of an American late-night talk show. Anderson Cooper is also openly gay, and according to The New York Times, he is the most prominent openly gay journalist on American television. As we know, he is a very private person, but in 2012, he allowed an email to be published that said he had been thinking about how private he was and that perhaps by staying quiet, he looked as if he were trying to hide something. He did not want people to think he was uncomfortable, ashamed or even afraid, though, because he is gay—"always have been, always will be"—and he said he could not be any more happy, comfortable or proud. Both men regularly talk about being gay — just like they both talk about many different aspects within their lives, since they are on national television and are currently touring on a show that is all about personal matters. And just as their professional choices have inspired many, their personal lives, too, are inspiring. Apple CEO Tim Cook even turned to Cooper for advice before coming out as gay, and I'm sure they have both helped numerous others with this decision. THEIR CO-HOSTING SET A RECORD FOR CNN. This year, Andy Cohen and Anderson Cooper hosted CNN’s New Year’s Eve Live. The special resulted in 1.7 million total viewers in prime time, which is a record! There were also "+29 percent in total viewers and +39 percent growth" in the demo versus the previous year’s record-setting broadcast. Despite the high numbers, many called this new duo co-hosting on this beloved holiday a flop. People who were not fans of the broadcast flocked to Twitter to share their disappointment. As Cohen was scrolling through all the negative comments, Cooper told him to stop and to just ignore it all. This advice—combined with the same advice from his mother—caused Cohen to recalibrate and to redefine his relationship with social media, since so much negativity exists out there. As I mentioned, Cooper is a catastrophist, so he sort of has to be super tough and able to deal with anything that does and could happen. In Cohen’s words, he is “unflappable,” as his career has put him in some crazy situations. And while dealing with bickering housewives and upset social media fans may be a different sort of crazy than reporting live from a war zone, Cohen is still learning from his friend, as the two continue to persevere, remaining cool and confident, no matter their situations. When traveling, Andy Cohen must have chicken backstage. Now, when he is traveling with Anderson Cooper for their show, they usually go out to eat. So Cohen may not even need or eat the chicken. But he stills wants it there. And he can have whatever he would like, right? Cooper also commented once about his eating habits onstage; Cohen just started eating jelly beans during one of their live evening shows, which Cooper thought was kind of odd and maybe even rude. But, once again, if Cohen wants candy, he can have and eat candy! When it comes to Cooper’s eating habits, he eats the same food day after day. Recently, he was apparently only eating scrambled eggs. And he didn’t put anything on them. And he ate them for every meal of the day. Before that, it was baked potatoes and then oatmeal raisin bars and then veggie burgers - one food for three meals for months at a time. Many may find the idea of eating the same thing over and over gross or boring, but...Cooper, too, can have and can eat whatever he wants, just like his pal Cohen can have chicken and eat jelly beans! Anderson Cooper was born on June 3, 1967. Andy Cohen was born on June 2, 1968. That means that both of these television personalities are Geminis. According to the zodiac, Geminis are social butterflies. They love interacting with people and need lots of intellectual stimulation. Yes, those that are born between May 21st and June 20th. And like Cohen and Cooper, like to say “I think” (the Gemini motto), and the symbol for this sign is The Twins. Cooper and Cohen are certainly social and are certainly involved with tons of people; from Hollywood starlets to presidents. They obviously both say “I think” a lot, and these thoughts have led to amazing career opportunities; like new works such as books and TV shows and AC². (They had to think up the idea to make this social event happen!) And the fact that their zodiac symbol is The Twins... These two are like twins, since they are so similar since they sometimes dress alike, are both silver foxes, and they can often be found together! Plus, just think of all the joint birthday parties that probably take place each year with all their famous friends... I am definitely a bit jealous. Speaking of all of these famous friends who can all be seen together... 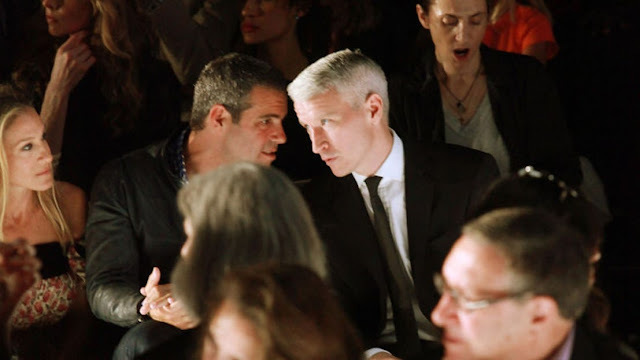 Within Andy Cohen and Anderson Cooper’s lines of work, they have both met their fair share of celebs. They are, after all, celebrities themselves. And even though they interview people like Stormy Daniels and Melania Trump (Cooper) and Jimmy Buffet, Martha Stewart, Jerry O’Connell and Rashida Jones (Cohen), they are actual friends with some even bigger names. As we have learned (or as huge and true fans have reread), Cooper is more of a private person, but when he is out and about, it is not uncommon for Cohen to be around. And Cohen’s friend list is also as famous and as envious as Taylor Swift’s. (Who am I kidding, I would much rather hang out with Cohen and his clan!) Sarah Jessica Parker, Kelly Ripa, Jerry Seinfeld, and Jimmy Fallon are just a few of the stars that can be seen with these stars. So, there are numerous reasons to love AC and AC, as we all know and have learned, but our pop culture-loving world especially loves famous people, and we just cannot get enough when these people hang out in real life...like these guys all do! We are nearing the end of this list, so let us recap: Andy Cohen, the host of Watch What Happens Live, and Anderson Cooper, a CNN journalist, are both beloved celebrities. For a few years now, they have been touring together on AC²: An Intimate Evening With Anderson Cooper and Andy Cohen, full of deep talk and shallow tales. They were friends long before this show started, but now, people are able to see them up close and personal — which means we get to admire their looks. I may sound shallow, but this is definitely another reason to love them even more. Yes, they are talented journalists who report on matters such as politics and pop-culture. Yes, they have written books and spoken out about important topics. Yes, they are famous and have famous friends. And yes, whether we are talking about just Cohen or just Cooper or AC², we will have a list of accomplishments and fun facts and amazing details. But look at them! On top of all of that, they are both insanely gorgeous! Those smiles...those bodies...those perfectly chiseled faces...those stylish outfits...I love it all and think everyone else should as well. Most people have heard of Anderson Cooper and Andy Cohen, and their fans know that they tour together and that they have been friends for some time now, and to us, that is the best part about all of this. The 14 previous details within this article go on and on about other aspects of their lives, but it all boils down to one thing: They are real humans with a real friendship. They grab late-night snacks together. They watch different forms of entertainment together. They plan things together. They go on trips together. They attend events together, along with their other famous friends. They are just like us! And sure, our forms of entertainment may not include front-row seats to fashion shows, and our planning processes may not include getting ready for sold-out performances, but we have friends, and we are familiar with all of these experiences. And the fact that AC and AC go through all of them together is just too adorable! Separately, they are amazing, but together, they really are too good to be true. And if they need one more member within their friend group...Well, my contact details can be found via my byline above! Please click on above link for original post with additional photos. Trump is such a liar it is ridiculous how the media keeps reporting what he says. like: "The Russia probe has destroyed young and beautiful lives." Like who? No ones life has been destroyed by the legitimate investigation, and the media doesn't call him out on this. Dana Bash do your job. Anderson hold their feet to the fire. Trump is a liar and just because his base wants to believe all his nonsense doesn't mean you have to take "his silly tweets" seriously. Donald Trump is a liar. The only thing not legitimate is his presidency!